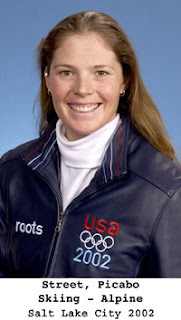 Olympic medalist Picabo Street -- whose unusual first name comes from the Native American word that means "shining waters" and is pronounced "peek-a-boo" -- recently earned the respect and admiration of her local community when she headed the fund raising efforts for a much-needed addition to the Sun Valley Hospital. You see, the nearest hospital with an Intensive Care Unit was located over 150 miles away in Boise. Leading the way, Ms. Street was instrumental in securing the necessary financing for a brand new state-of-the-art intensive care wing which is now fully operational. Yes, you guessed it, the facility is named the Picabo ICU. To the Need to Vent! staff at their Intergalactic Headquarters: Pull your head down out of the stars as Snopes.com fairly debunks the Picabo Street story with an update way back in August of 2007. The gist of their reporting is that this story has been around in several forms for many years, at least as long as she has been competing in the Olympics; although I'm the first to agree, it is quite cute. You can find it by searching Snopes for Picabo Street. Wonder how she feels about it? In any event, thanks for writing in. I guess that's about all for now as it is time for us to take a ride on the Reading. The Staff at Needtovent doesn't feel we have ever had our heads in the stars, but we do occasionally have them up something that is terrestrial and less pleasant. We totally agree that our Picabo Street posting was misleading. As a result, any future posting that is simply a joke or a story that is not based in fact will be dutifully designated as such. Thanks, again, for your valuable comment which has been taken to heart. OBAMA'S WON THE NOBEL PEACE PRIZE -- WTF? !